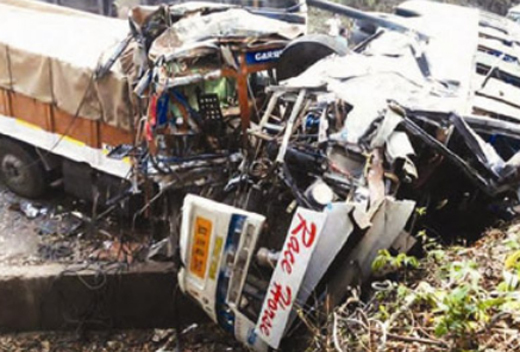 Mangaluru Feb11, 2016: A cement laden lorry and a private bus collision injured 40 people including bride and groom. The incident took place at Addhole near Gundia Gate at Mangaluru- Bengaluru highway on February 10, Wednesday. It is learnt that the marriage bus was on its way back to Bengaluru from Dharmastala after the wedding function. The cement laden lorry plying towards Mangaluru hit the bus at Addahole near Gundia negotiating a curve. On the information SP Sharanappa along with the squad rushed the spot and identified that injured persons in the bus were hailing from Jayanagara in Bengaluru had been to attend the wedding function. They were shifted to the Hospitals in Manglauru. The newly wedded couple Vivek and Ramya sustain minor injuries in the accident is said. Except the lorry driver all the others injured were out of danger. The investigation is going on in Mangaluru police station. Hope the lorry driver safe. The impact of looks serious. So many accidents but no body learns from it but repeat the same.